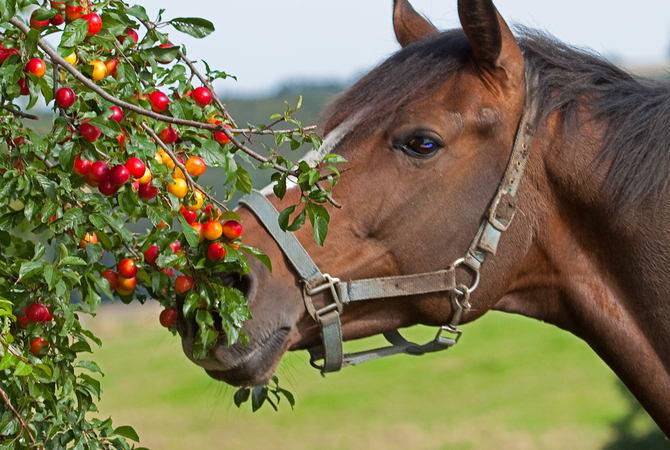 Horse investigating possibly poisonous red berries on a tree in pasture. Horses often ingest poisons in the form of animal baits, insecticides, toxic plants or forage, improperly stored grain and hay, drugs and medications given in an overdose or by an improper route, household or barn and stable cleaning compounds, paint, and other toxic substances. In any case of suspected poisoning, call your veterinarian at once. If possible identify the source of the poisoning and the type of poison involved. Specific antidotes are available for some poisons. If the poison is known, call the National Animal Poison Control Center at (888) 426-4435 or (800) 548-2433. The center is open 24 hours a day. A small charge is made for their services, but is well worth it considering the health of your horse. You may also call your local hospital and ask for information from the Poison Control Center. Give a charcoal slurry via stomach tube to absorb chemicals remaining in the stomach and intestines. The slurry should consist of a pound of activated charcoal mixed with 2 quarts of water for an adult horse. For a foal, mix 1/2 pound of activated charcoal with 1 quart of water. Give a laxative immediately after the charcoal slurry. Magnesium sulphate also known as Epsom salt or sodium sulfate (Glauber's salt) are recommended by most veterinarians. Dissolve the laxative in water at a rate of 1 pound of laxative per gallon for a mature horse or 1/3 pound of laxative in 1/3 gallon of water for a foal. In some cases, mineral oil which serves as a mild laxative and intestinal protectorant is recommended. Given via a stomach tube, a mature horse should receive 3 to 4 quarts, and a foal should be given 1 pint. Large volumes of intravenous fluids may be given in acute poisoning to support circulation, treat shock and protect the kidneys. Corticosteroids may be given for their anti-inflammatory effects. Follow the advice of your veterinarian. If the horse is in a coma, tracheal intubation and artificial ventilation may be necessary. In cases of convulsions intravenous Valium, phenobarbital or Robaxin may be given. Ingestion of poison animal baits containing strychnine, arsenic, zinc, and other poisons occurs when the baits are left in accessible areas in the barn, pasture, stable or near trails where horses are ridden or exercised. In all cases of suspected poisoning, your veterinarian is your first line of defense. Although toxic baits are now used less frequently, they pose a problem because horses often see them as food and ingest them accordingly. Symptoms of bait poisoning include lack of coordination, hyperexcitability, tremors, seizures, respiratory depression and collapse. Death may occur in a very short time if the symptoms are not recognized and prompt first aid treatment initiated. Treatment includes intravenous pentobarbital or phenobarbital, administration of oxygen, the maintenance of a quiet environment and avoidance of unnecessary handling or movement. Again, advice and assistance of a veterinarian are recommended. Organophosphates and carbamates are compounds used extensively in pesticides and dewormers. Horses are exposed to these toxic compounds on a regular basis. Signs of toxicity are hyperexcitability, colic, muscle tremors, patchy sweating, salivation, diarrhea and a stiff-legged gait or staggering. The horse may collapse and respiratory failure may occur. As in other types of poisoning, removal of toxic contents from the stomach followed by administration of an activated charcoal slurry and then a laxative are recommended treatment. Intravenous atropine may be given for hyperexcitability and salivation. Protopam chloride (2-Pam) is administered as an antidote to organophosphate poisoning. In all cases of suspected poisoning, your veterinarian is your first line of defense and should be called immediately.